Playing card collector and enthusiast. Playing Card Collector? or Playing Card Dealer? Prism: Day & Dusk. Now Live on Kickstarter. Sideshow Playing Cards – On Kickstarter NOW! And FREE Decks GIVEAWAY!! Duel Playing Cards | Vanda Artists Series – Live on Kickstarter!! Learn Spanish or French (while) Playing Cards – On Kickstarter NOW! The Fall of Troy ][ Epic Playing Cards. On Kickstarter NOW! Medical Cannabis Playing Cards – On Kickstarter NOW!! ‘Chord Cards’ Playing Cards – Learn Guitar the Fun Way!! Rogue Queen Playing Cards by Galen Nicole – Successfully Funded on Kickstarter!! Bicycle ‘Olympus’ Playing Cards Review – On Kickstarter NOW! Piff The Magic Dragon Playing Cards – The PiffDeck on Kickstarter NOW! ‘Branle’ Playing Cards by NoirArts – on Kickstarter NOW! Uncut Sheets. The Unsung Heroes of the Playing Card World. For those of you who – like me – love the idea of being ‘able’ to play the guitar, but just can’t get the hang of where to place your fingers to get the guitar to make those beautiful sounds, then this deck is for you. The ‘Chord Cards’ deck is now being funded on Kickstarter with funding closing on 15th August (2015). The idea behind this deck is nothing short of genius. And the genius in question is the younger brother of Logan Kennedy, the deck designer. Of course I jest. The genius is Logan himself, but as with all great inventing stories, inspiration had to come from somewhere, and in this instance it was the kid. Sitting strumming away on his guitar one day, Logan’s brother decided to try and copy him on his own little ukulele but couldn’t quite grasp the finger placements. Because of this he became distracted and ended up taking a playing card and sliding it between the strings and the neck of the ukulele. Logan noticed that a card is roughly the same width of the neck and so drew lines on the card and used stickers to show his brother where his fingers should go, and voilà!!! a brilliant idea was born. With 52 different chords to choose from, this deck caters for not only the complete novice but also the more experienced player keen on learning new chords. Choose any card you like and simply slide it in between the neck and the strings. Then line the card up with the strings and put your fingers in the designated spots – now you’re playing guitar!! There’s also an uncut sheet available to either simply frame and have as a cool piece of art, or to use as a reference guide. 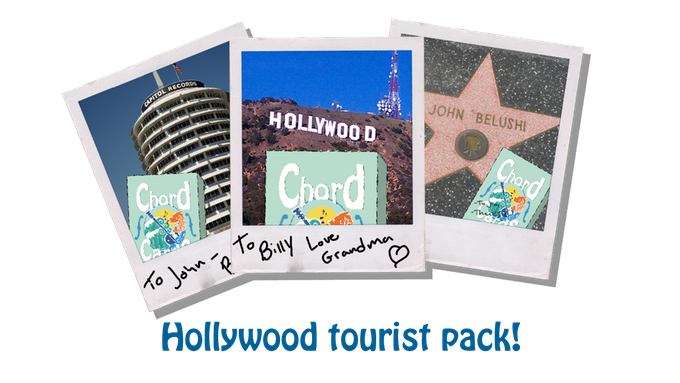 One of the tiers on this Kickstarter campaign that I really like is, for $25, you get a deck of the cards with anything you want written on it (your name, someone else’s name, a random cryptic message…) which will then be taken to one of Los Angeles’ famous tourist attractions, and a photo will be taken of YOUR cards which will be posted to you along with your deck. Of course, as this deck is mainly for learning chords, the only playing card references are the indexes in the corners. No fancy Ace of Spades and no arty-farty face cards. Which is absolutely fine. There’s nothing worse than when someone designs a deck of cards with a ‘dual purpose’ that really caters to neither purpose to any degree of success. But with this deck, once you’re fed up of practicing your chords, you simply gather up the cards and play a hand of poker with your mates. Actually, even without the ‘playing card’ aspect, these would be a great idea for guitar beginners. But of course, being a playing card collector, I’m perfectly happy that these are exactly what they are, because otherwise I wouldn’t have happened across them. To sum up, this is a truly fantastic deck of cards which was born out of passion and dedication. (If you need proof, read the interview below.) This is one guy who knows what he is doing. And he is determined to succeed. If Logan gets the full funding for these – and why wouldn’t he? – he plans on releasing not only a ukulele version, but also a bass guitar version, and a banjo version. With patents applied for, this is surely going to be an accomplished venture, and I certainly wish him every success with it. Logan Kennedy has very kindly agreed to answer a few questions for me about the deck. So if you’re wondering whether a left handed deck will be available, what the Jokers look like, or how he became interested in playing cards in the first place, then keep reading…..
Logan Kennedy of LoAdCartoons – I always kind of thought that I was a bit of a cardist, but after being exposed to the higher levels of real cardists and magicians online it’s hard to say that’s the case anymore – maybe a card groupie is more applicable. My mother was a card collector and loved playing card games so that’s where my initial interest comes from. As well as from my grandmother in Indiana who has ancient, beautiful decks of cards from long gone road side attractions and volumes of Edmond Hoyles books collecting dust on her shelves. They were never referenced because she always knew the rules better anyway, especially if she was winning. So I spent many afternoons being taught games and playing cards. If that makes me a cardist on some level maybe. It should explain my love of cards anyway. iCPC – I’m not familiar with CustomizedPlayingCards.com’s products so forgive my ignorance here, but what is the quality and handling of the cards like for cardists and magicians and more ‘serious’ card players? Logan – I became associated with Customizedplayingcards.com through my dad, who worked for the owner (Charlie Levin) years ago in Orlando making decks of cards for attractions there as well as in Las Vegas. When I brought the idea up to my Dad he immediately told me to call Charlie and start the process. They have done decks of cards for everyone from World Poker Tour to Ben & Jerry (as well as some other crowdfunders, I’ve been told) also custom games, dice and so on. Charlie is like one of those old school business guys who if you tell him you need something he convinces you almost immediately that he can get it. And I guess they expanded their facility in central Florida recently as well so I’m dealing with a place that if I needed to I could stop by and talk to them. Charlie, and his right hand guy (another good family friend Stephen Sherrin) immediately encouraged me to try a Kickstarter. I came to them and explained that I wanted to make the decks as per the widest suggestions and consensus’ I can gather from the real experts here online. But Charlie and the guys shushed my concerns because apparently they make any and every type of card known. iCPC – Obviously this deck is ideal for the beginner, but there are a lot of chords in there – 52 in fact. Would you say that the deck is also for the more experienced player wanting to learn complicated or lesser-used chords? Logan – I suppose that’s the case. I don’t use anywhere near 52 Chords myself playing guitar, but I’m hardly Jimmy Page. But just the experience of assembling these cards has exposed me to the magnitude of chords that are out there. Maybe it’s like having that sports car that can go 200 miles an hour – you’ll never go that fast, but it might be nice to try once in awhile. There’s a great interview with Paul MacCartney where he talked about how hard it was in the 50’s to learn rare chords, and the challenges to find people that could teach them to you. Now with the internet and other resources it makes it so much easier. Anyone who has ever had to look at chords in a book or watch a teacher sitting across from you as you try to learn, knows how tedious it can be. With a deck like this it makes it much easier, at least in my opinion and the opinions of the people I’ve shown it to. Guitar players can get pretty obsessive about learning chords, like any other collector. iCPC – If this proves to be a success, and you do end up releasing other decks (banjo, bass & ukulele), will you be developing a left-handed version of any of them? Logan – Absolutely, this one of those things that we would like to tell ourselves we would have thought of at a later date but our online friends and guitar pros pointed this out to us before we got there. We would actually like to try and offer them ASAP. For sure this is the starting point. iCPC – …..and will there be different sizes, for example for smaller hands and smaller (learner/junior) instruments? Logan – Yes, the Ukulele deck for instance, excluding the baritone uke, (because it is tuned differently) would be appropriate to the neck and string placements, as with all the instruments we hope to pair chord cards with, the decks would have to meet those specs. Luckily any alternate sized cards we would need already exist. What’s interesting, (on a side note) and kind of took us by surprise, is how there is already an association with playing cards to the guitar. 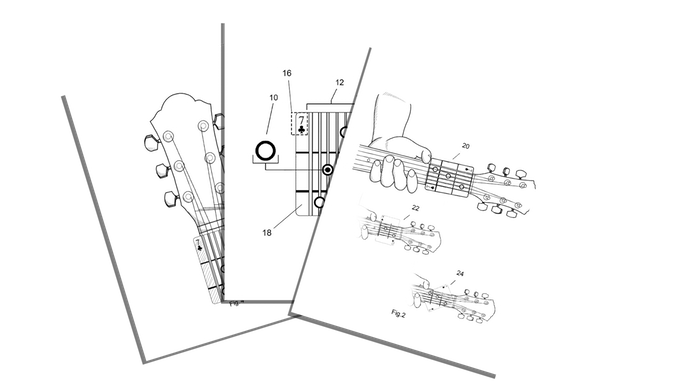 After all the bridge on a guitar is approximately 2.5 inches wide, so guitar makers shim it with cards and use them to reference the build – Johnny Cash and other musicians would weave a card into the strings to create a unique sound. Guitar collectors use a card to check the distance between the 7th fret and the strings to tell if the neck is bent too much on an old guitar, and so on. So it seemed like a natural pairing. iCPC – To me, the back design seems to be a wave playing a guitar, so I’m guessing that you’re a surfer in your spare time when you’re not playing guitar or designing playing cards……..? iCPC – Ah, well… ‘Suppose I can’t be right about everything :D You are one half of LoAdCartoons, creators of “online games, cartoons, inventions, messes and comics”. Are there any plans to release any more decks featuring some of your own cartoons/artwork? Logan – My brother Adam is the other half of “LoAd”. We have a great time doing our things. If there was an interest to do some cards outside of Chord Cards we might. I would really like to nurture this to it’s fullest potential first before we think about that. I’m having a great experience learning from everyone, and the home run would be to hear from that person later who learned to play because of this product. We also want to satisfy those die hard cardists and pass their inspection as well. There’s some great cards out there already, the bar is pretty high. iCPC – What’s the story with the Jokers……? Logan – As for the jokers, well we emphasized the key cards and information on what color indicates which finger. We figured those cards were important for the presentation, but it wouldn’t be a deck of cards without jokers. As you can see the jokers are basically impossible chords, just for fun, any guitar fan would know that a “J” chord doesn’t even exist. If you’d be interested in backing this deck, then please just click on over to the project page. And again, for anyone not sure about how Kickstarter works, click here for a rundown. So, what do you make of this deck? Are you a guitar player and you wish there was something like this around when you were trying to learn? Would you buy a deck of these for your kids or partner or anyone else who wanted to learn guitar? Feel free to leave me some comments in the box below. Or if you have any questions, I’ll be more than happy to answer them. And if you like this post, please share it on your social media by clicking on any of the buttons below. Thanks for reading!! This entry was posted in Playing Card Reviews on 16 July, 2015 by Jyl. at first I was like: Oh come on, how could some playing cards actually help me learning to play the guitar? However I read further and I think it is really impressive. On the one side, it is such a simple idea and on the other side it is clever as hell. I wanted to learn to play the guitar for quite a while, this could really be something that helps me! Thank you very much for this article! Hey, first of all I just want to say that you have an awesome site, and I love this idea for The Chord Cards. I used to play guitar years ago, but would not have a clue where I’d start now, lol. 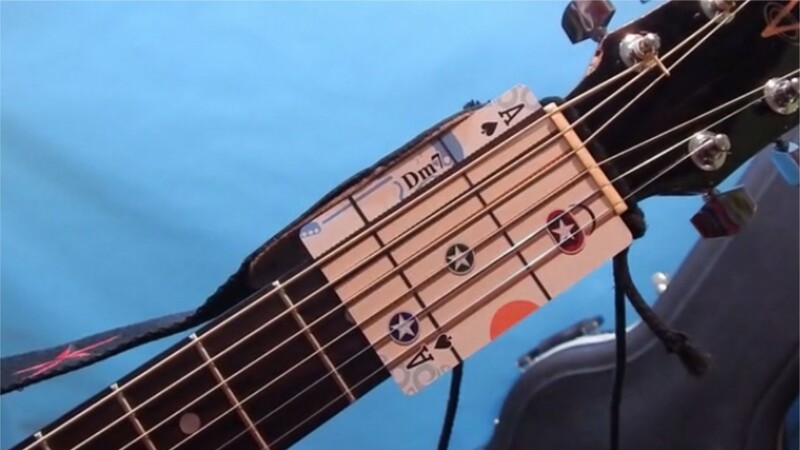 This would be a great way for remembering how to play chords and notes again. These cards look great! I play the guitar and remembering the chords are sometimes a real pain. Especially for players who are new to the concept. These can be quite helpful for people who have problems remembering chords and i think that these won’t be too uncomfortable to play with. But that’s just my opinion of course. Great post thanks. Hmmmm…I’m not musician, but is this a really interesting post, heck, one day it could really end up one of those “life hack” websites. I’ve never thought of ever playing an instrument, using cards as my guide. I know many people that play the guitar or the bass, and the one thing they struggle with as you stated in your site, placing their fingers in the right direction. Great post i am a big fan of cards and i always enjoy playing with my family & friends, but this is the first time to know that the cards can be used in Guitar tutorial i tried before to follow some YouTube videos but i found it too difficult to me and i forgot about the idea, by your article i think i will think again to learn guitar as it will be more fun and easy by those cards, glad that i found your website. Thanks for sharing and keep posting. 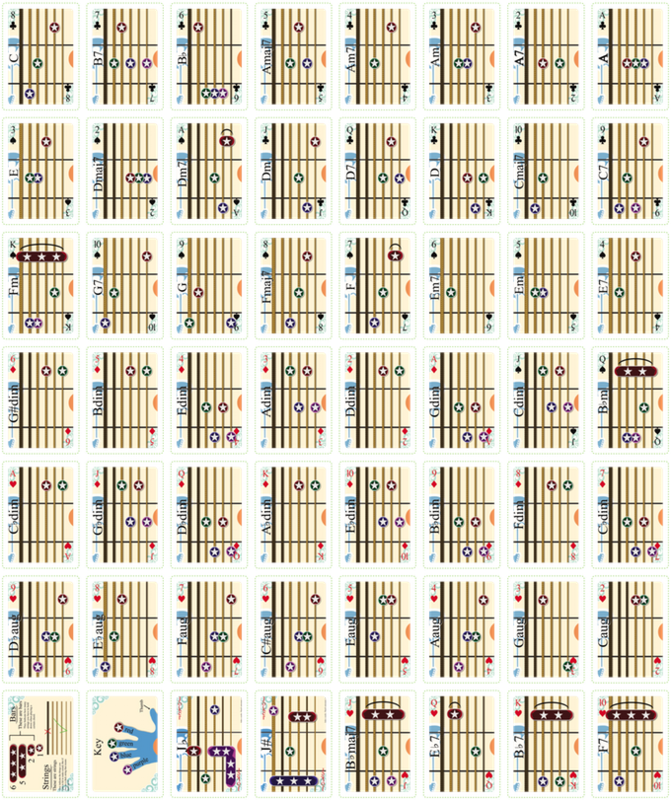 I believe you have developed quite a neat post with these chord cards I have always wanted to learn how to play the guitar but haven’t gotten around to it, I think mostly because I would have needed a teacher. I think these are great especially for those who are like me and would love to learn from the comfort of their own home. I love kickstarter, they have many great products there that I hope succeed in fundraising the money that they need, I also have a post on my website about a candle that is from there that especially fits the halloween season. And a fantastic idea. Learning new things just gets easier and easier. How did you manage to touch base with Logan? I tried to learn the guitar once but my fingers are too short and I can’t get my fingers on the strings to strum a note! Hi Stacey, I know how you feel… I have short fingers too. I’ve tried all my life on and off to learn guitar with no success. But I’m expecting delivery of a couple of these decks and I’ll be getting my guitar out of the garage and giving it another go. First off …I just found your site and I love it! Secondly, what a brilliant idea this is. I used to play guitar when I was young but got bored of the chord books. I would have absolutely loved this and this would have made it so much easier. Now my son wants to play guitar and I think this would be a brilliant gift. I also looked up kickstarter, which I think is a pretty awesome idea as well, so I’m going to check it out. Someone in our house is learning to play the guitar and trust me – they need all the help they can get. What I love about these is that the idea is so simple. You have to wonder why nobody thought of them before! But I guess that’s what we say about all these new inventions! First of all I had to say I had a giggle at your site name. I think the idea of the finger placement prints on the cards is fantastic! I would never have thought of such a great idea to teach people to play the guitar, I usually just put my fingers anywhere and strum like a mad man haha (I haven’t learnt to play obviously). This would be an awesome business idea to sell the cards and the guitar as a package for beginners to learn to play! Wow, coming from a guy that studied guitar in Leeds college of music – this is an awesome product! Hello Jyl, I am a guitarist of 30 years and I think this is an excellent idea. It would have made life so much easier when I first started out. There are many ways these days of course with all the new technology but this card approach is more hands on and visual and the cards are actually rather attractive. I’d be interested to see if these collections expand, as chord study really can get quite deep with all the inversions and permutations across the fretboard. Great review with nice use of visuals. I found your site connected to the Rogue Queen Playing Cards which I have pledged to. This is my first stop here. And Oh, by the way I’m a collector too. While visiting your site I spotted the “Chord Cards’ Playing Cards” which I do not have in my collection. Do you know of any places that are selling this deck? those look so cool! Honestly, ive just started picking guitar back up again and could really use those. I havent checked out the kickstarter page yet but I think I have to, because those are certainly something I like and would use!! How come most of these cards are on kickstarter though? Wow! this is truly an original way to learn new chords on the guitar! I was really amazed to see this blog never heard of such a thing. I just might take up the guitar again and give these cards a try. What a great idea. Do you have card for 12 string guitar? The post focussing particularly on the musical chord deck of cards is so relevant to many people, and really appeals to a visual style of learning – great for people who struggle with their memory a little! I also really liked the page about what Kickstarter actually is, it is lengthy but very thorough and insightful in helping readers to understand the website, and guiding them through any future investments so to speak. This is a beautiful and innovating idea!! I’m sure it will rock on kick starter!! Now I have a 3 year old boy who is showing some interest in music, he will turn 4 in 4 months, so maybe then this beautiful item could help me teach him some beginner lessons on the guitar. What a unique idea. The person who invented these cards is a genius. If I had had these when I was younger, then maybe I would have continued my playing, instead of learning all those boring classical pieces. Can’t wait to tell my aunt about these, but will have to explain the concept as she is an avid musician but does not own or believe in a computer. 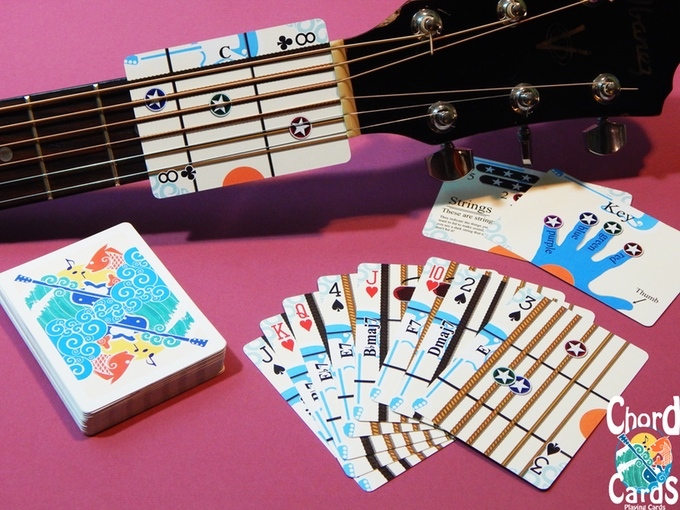 Who would have thought that a guitar and playing cards could be used together to help somebody learn to play? I would have loved to have learnt to play the guitar and if these had been around all of those years ago, who knows? What a fantastic idea and so simple too,congratulations. Thanks Paul…. and you know, it’s never too late…. I’ve pledged for my decks and I can’t wait to get them – I have a guitar in the garage gathering dust and I can’t wait to bring it in and test these babies out on it! I’m 45 and have been ‘trying’ to learn guitar on and off since I was 8… just couldn’t get the hang of it. I reckon now it’ll be a whole lot easier. There are a lot of guitar players who have contacted me to say that they wish these were available when they were learning so they must KNOW it’s a great idea. Come on Paul. Give it a go..!! Well, it looks AWESOME! With these playing cards you now can play not only cards but guitar as well! Thank you, Jyl, for sharing this! Absolutely brilliant! I struggled learning how to play when I started out. I found looking at a book then my fingers then back to the book was frustrating. I tried YouTube videos and I still became frustrated because it always sounded better on the video. These cards make it more interesting to learn. I can compare it to when I was in the military doing physical training. Most of my guys hated it, but when we did “card PT”, everyone was all in and had a great time. I will definitely spread the word out to some novices that I know and maybe get some for myself for a novelty or refresher. Thank you Dan, though now you have me curious as to what exactly Card PT is……. is it where you all pretend to the Drill Instructor like you’re doing press-ups but really you’re playing poker…?? Seriously though, I appreciate it when actual guitar players comment so positively about this deck. I’m a ‘wannabe guitarist’ (I blame being left handed but always being taught the right handed way, which confused me…) and I actually can’t wait to receive my decks so I can get playing. Basically, card PT is when each card denotes which exercise to do and how many. For instance, clubs would be push ups. If a 5 of clubs was drawn, everyone would have to do 5 push ups. Face cards were usually multiples of 5, 10, etc. Then Joker’s were wild and the one who drew it chose what exercise and how many to do. Enough rambling. I will let my guys know about these decks and also my poker buddies who like to collect decks. A win win! wow. this is one of those ideas you see and you kick yourself because it’s so good you wonder why you didn’t think of it first! this is fantastic. i taught myself guitar about 15 or so years ago using tabs online. i, for whatever reason, picked it up quickly so friends of mine over the years have asked me to teach them. i tried to teach a few and noticed that people seem to have trouble reading tabs when printed on the computer. it’s so strange. these cards would most definitely help them practice one chord at a time, i think this is pretty cool. great work! OK this totally blew my mind… I’m a music enthusiast but always been too afraid to learn an instrument. When I was young I had the chance to learn the piano but I was so scared, just couldn’t get past that. What if I sucked at it? The guitar has always fascinated me though… this would have definitely helped push me into it. Awesome post, thanks! I love it, I love it. These chord cards are truly amazing. I have never heard of them before but my niece has just started playing the guitar and she is becoming a little overwhelmed by it all so these chord cards would make a wonderful gift. Can they be custom made? Hi Paula. They’re definitely good for the beginner, and even expert guitarists have said that they wish these were about when they were learning, so they’re obviously a winner all round. What do you mean by custom made….? This is a pretty cool deck of cards, I’m not sure how effective it will be but I kind of see how the relation to the image and the sound could help you remember the chords. I wish I would have seen this 10 years ago when I tried teaching myself the guitar :P.
These are brilliant! Never really took much interest in playing cards except for family games of snap when I was a kid! These are very creative and a great way to learn guitar! Never believed playing cards could be so artistic!! 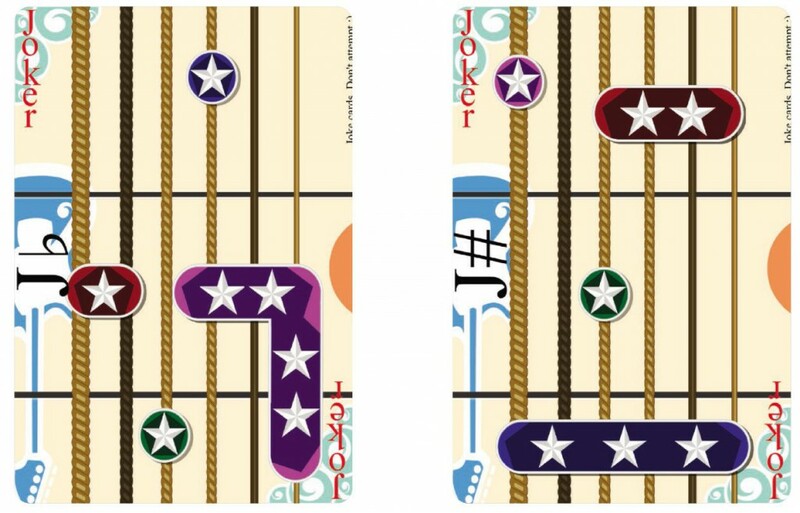 I really enjoyed your article about these guitar playing cards. I am a guitar player and I can tell you when teaching a beginner any chords there are a lot of drawing the chords out, usually on notebook paper. I know what a pain it is to draw these reference’s out on paper. But the ingenuity to print these chords out on a deck of playing cards? What a fantastic idea! I wish I would have thought of this! Another great value to this article is the Q and A from the artist/author himself on what these cards represent to him as well as to everyone. I just might have to go purchase some for my other family members that are wanting to follow in my footsteps. Thank you. This is a very cool idea. The extent of my guitar playing involves picking up a guitar – placing fingers on stings in some random place and then strumming the strings. It never sounds like anything resembling music. I think these cards would help me a lot. Can someone start with no experience and use the cards to learn? Ah, you have out done yourself this time! I have always enjoyed coming to see what deck you have recently come across but this time I was surprised by the nature of the deck. I remember when my son was learning to play the guitar and how he struggled with chords and such. This would have been an awesome tool to help him. I think the ideas at kickstarter is amazing and whoever thought about this deck should make millions. I would definately buy a deck for a new or young guitarist. These are very useful cards to be used in learning guitar chords. I am learning guitar for about a year now and I sometimes forget the position of the chords. These cards are really useful and fun to use. I will definitely give this a try and share these with my friends so that learning guitar chords will be a fun and enjoyable activity. This is really cool. My mother-in-law is “learning” to play guitar, as we speak. I think these Chord Cards playing cards would be a great addition for her. I love that it has a Joker card which is impossible to play. That would confuse my mother-in-law for sure. I’m going to keep it a secret and see if she can figure it out on her own. Ha! Anyway, I’m glad I found this article. Thanks for sharing. I found this really interesting. I’ve always wanted to learn how to play the guitar but I’ve never got around to taking lessons. This is a cool idea for people wanting to learn. It seems like this might be a way for people to learn the guitar without an instructor. Do you think the transition of using these cards to not using them is difficult? I wonder if some people can only play guitar with the use of the cards and as soon as the card is gone they are useless. Double Cards – Playing Cards that guarantee a whole new level of fun. Jyl on Double Cards – Playing Cards that guarantee a whole new level of fun. Scott Hinkle on Double Cards – Playing Cards that guarantee a whole new level of fun. You might also be interested in….